This guide has been a long time coming. Dutching, or the process of betting across multiple bookmakers for the purpose of making a profit, is a necessary tactic for a couple of main reasons. Sometimes, those that are matched betting need to find an alternative to a betting exchange – perhaps there isn’t a market available on the exchange yet, or that there isn’t a close odds match available. The second of the reasons is slightly more complex, and it means I need to split this guide into to sections. Betting exchanges aren’t available in every country in the world. Most notably, America doesn’t have exchanges. A large portion of Africa doesn’t. The list goes on. It is impossible for me to have a guide that lists how to do matched betting in every single country in the world. I simply don’t have the capacity to write that much, never mind the fact that I’d need to know the legislation in every country, the bookmakers based in each one too, the terms that go with their offers…I’m sure you see where I’m coming from. Those in countries without betting exchanges need to dutch every bet; that’s the qualifying bet (to unlock a free bet) and free bets too. I will be covering foreign countries in the second half of this post – feel free to skip straight to it – but let’s dive into the quicker-to-explain first scenario right now. This is by far the easiest aspect of dutching to cover. Because I do it myself and therefore fully understand the process. In the second section of this dutching guide (doing it in countries without access to exchanges) I am teaching based on knowledge, but not experience. This might shock you, but I don’t have experience of betting in foreign countries because I do not live in one. So, whilst I feel comfortable teaching somebody the basics of dutching for the purpose of qualifying for free bets and for using them abroad, it’s much easier for me to teach this first use case of dutching. Why do Matched Bettors Need Dutching? There are a large variety of reasons that we need dutching, even those of us fortunate enough to have access to exchanges. 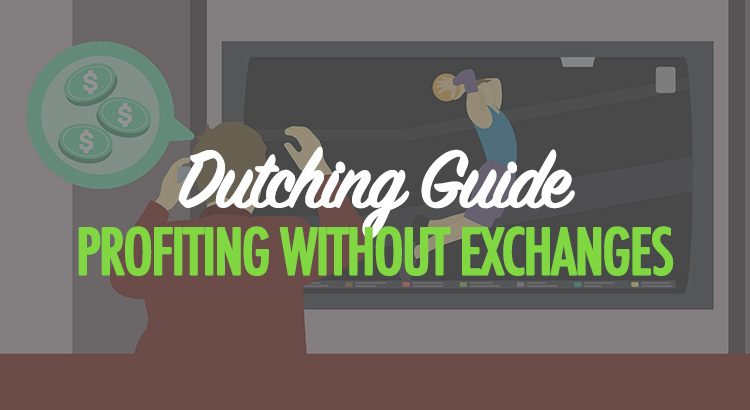 The most obvious reason for dutching is as a form of arbitrage; guaranteeing a profit instantly by backing across two or three bookmakers. The rating shows the amount of profit you’d get per £100 staked. You can see that on all-but-one of the results in the screenshot, there are only two bookmakers required for the dutch. This is because they’re on tennis matches where only two outcomes can occur – one player winning or the other. The final result shows a three-way dutch on a football match, because in football there is the third match outcome of a draw. Other than arbitrage, tennis betting, in general, is actually a huge use-case for dutching. Many bookmakers do not use the same tennis retirement rules as the betting exchanges. This means, in very rare circumstances, you could lose a reasonable amount of money if you back and lay a tennis player via the exchange and then they retire from a match injured. It could also work massively in your favour if the other player retires, but of course the risk here is the uncertainty. If you are ever looking to back and lay a tennis match via the exchange, ensure you’re using a bookmaker that uses matching retirement rules. You can find up-to-date lists of these via the majority of the biggest matched betting sites. Another reason we need dutching is because, sometimes, you can get a close match odds selection for an offer without needing an exchange. For example, you could be exploiting 2up and there may be a time when the odds on the bookmaker and the exchange are too far out. However, because some sites often overprice the ‘draw’, it can be possible to dutch across three bookmaker sites to qualify for 2-up (and perhaps another offer or two on the other sites in the process). In the most extreme scenario – and this one takes a fair amount of experience – you can dutch the entire field of horses in a race for extra places. Many people often say – and I’ve probably (almost certainly) been guilty of saying this in the past myself – that you can’t do matched betting if you’re in a country that doesn’t have access to betting exchanges. It just means you need a different method to achieve the same end goal. This method, as opposed to backing and laying, is dutching. If you want to know how to do matched betting in America, Africa and more, this is the guide for you. If you’ve not jumped straight to this section then this will be slightly repetitive – only very briefly. This section of the guide is aimed at those people living in countries that don’t have access to betting exchanges. Please note, if you’re from the UK but are living abroad, this section probably doesn’t apply to you. If you still have a UK address and bank account then you should be able to legally access betting sites via a VPN, assuming it’s permitted to do in the country you’re residing in and doesn’t break the bookmaker T&Cs (always check this). For those wondering how to access sites via a VPN when abroad, I recently stumbled across a great guide here. You can back two different tennis players in the same match on two different bookmakers to cover the only outcomes that can occur in a match (one player winning or the other). Be careful to make sure that the player retirement rules match up on both sites. You can use three different bookmakers to cover all of the outcomes in a football (soccer) match – either side winning, or the draw. You can use two different bookmakers to cover any sport in the moneyline market in which there has to be a victor (American football, basketball etc.). You don’t need an exchange, they just help. There’s actually a step zero, I guess, which is the process of finding an offer you can exploit. If you find a sign-up offer, or reload offer, on at least one site, then you are good to go. This is probably the part that requires the most effort in countries without exchanges, because most aren’t fortunate to have access to sites that list all of the offers in one place. Using the dutching calculator on Oddschecker, you can input your stake and odds of each selection and see how much you will lose. I would link to it, but the calculator is kinda annoying because you can’t set what your stake actually is – you have to set your total stake and keep adjusting it until it matches the stake you need to bet. I’m gonna get one developed for right here on the site. You may have to look around on a variety of different bookmakers in order to find the best odds and the lowest qualifying losses, or highest profit, returns. You’ll need a different calculator for this step, I recommend using the dutching calculator on Oddsmonkey. It’s exactly the same process as the qualifying bet, but you’ll need to use the ‘Free Bet’ option as opposed to dutching normally. Once you have the free bet in one bookmaker account, find a reasonably high odds bet (4.5 to 8.0 ideally). Remember, the higher you go, the more profit you will make. However, you’ll also need more money in your other bookmaker(s) in order to dutch against. If you get odds of 6.0, and can back the other selection at another bookmaker at odds of around 1.18, you’d normally lose 85p on a £10 bet. However, if it was a £10 free bet, we’d be able to lock in £7.63 (we’d need to back £42.37 on the 1.18 selection). If the numbers are confusing you, that’s more than understandable. It is worth emphasising that by far the biggest part of betting like this, without exchanges, is the fact that you (probably) won’t have a site that lists all of the offers. This means you need to find the offers yourself, you need to check all of the terms yourself, this means it will take manual work. A lot of it. I’m not sure if you will have a website or tool for bookmakers in your country, like an oddsmatcher or an oddschecker, that compares the best odds from the betting sites where you are. Honestly, I wish I could be of greater help. And I appreciate that this hasn’t been the in-depth, actionable guide I’ve ever created. But it’s just impossible for me to know how bookmakers work in every country of the world, what the laws are where you are, whether you have exchanges, and so many more things that just make it all so confusing. I promise that I’ll do what I can, starting with guides like this, but I can’t provide in-depth assistance if you’re not in the UK unfortunately. I said above that I’ll create some calculators for assistance. I’ll start with that. I hope you’ve found this guide at least slightly useful and that you can use it as a base to start a profitable betting career. Dutching is a good way to have guaranteed profit, but bookmakers don’t like that way and closes accounts if you start to win too much. You’re right, but bookmakers close your account if you win too much via any method! Yes, bet365, Unibet, Williamhill do that, but sbobet and pinnacle have “winners welcome” politics. But in pinnacle and sbo very hard to win and make ROI 5-7%.